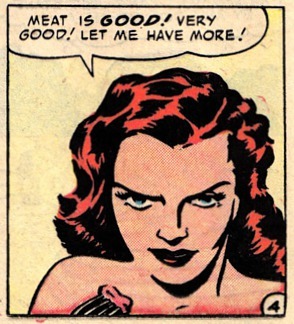 In 1952, comic books were a little odd. Most publishers were struggling to recover from the dying superhero craze and turned to horror. Keep in mind this is 1952. People were a little easier to unnerve in those days. The Ziff-Davis Publishing company (now an internet media behemoth) was one of the premier vendors of the macabre until it left the comic book industry entirely and let most of its comics fall into the public domain. 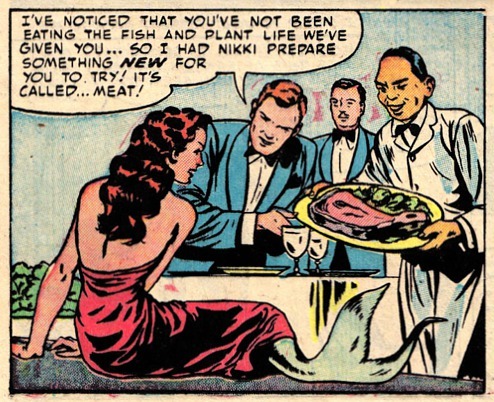 Here's Ziff-Davis' classic tale "The Devil from the Deep" about a mermaid who is introduced to the wonders of meat and she'll do anything to get more! Ooooooo — scary! This comes from Nightmare, No. 2, Fall 1952. Click below to download the story or the entire comic book.